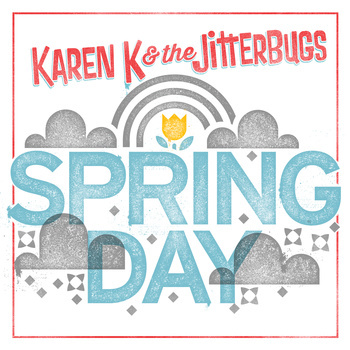 Karen K and the Jitterbugs' "Spring Day"
I say all that as a way of introducing "Spring Day," a brand new song from Karen K and the Jitterbugs. From its opening guitar riff aping Bryan Adams' "Summer of '69" to the abundance of "la la las," it's a pure pop confection celebrating the arrival (please!) of spring days. But as I look at weather forecasts of highs in the mid-90s this weekend, forgive me if I'm already dreaming of songs celebrating fall. Stream the song below and pay what you'd like for the track. Posted in Listen To This and tagged with Karen K and the Jitterbugs, Boston, spring, seasons, weather. March 29, 2015 by Stefan Shepherd.